Boethius (c.480-c.525), the most learned Roman of his time, can be though of as an author who represents the transition from the late Classical world to the early medieval world. His 'Consolation of Philosophy', written while he was imprisoned and awaiting trial and execution, is in the form of a dialogue between the author and a female personification of Philosophy. Although it was probably made in France, an erased flyleaf inscription suggests that this manuscript probably belonged to King's College, Cambridge, by the end of the Middle Ages. 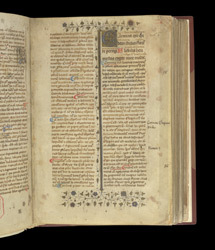 Following the end of the prologue, this page contains the start of the commentary itself, introduced by an illuminated initial 'C' and ivy-leaf borders. The Boethius text is written in larger script (4 lines at the top of the column), double-spaced, and the commentary is written in single-spaced smaller script (the rest of the column).